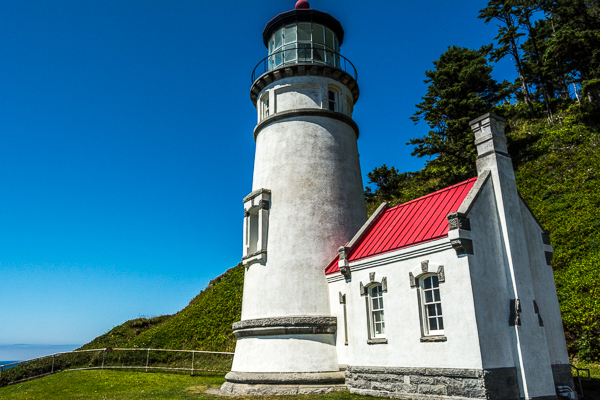 We hope to see as many of the lighthouses along the Oregon coast as we can before we travel south again. As a part of that effort today we leave the RV safely tucked in at the shop while we pay a call at Heceta Head Lighthouse. Feeling adventurous, I ask Storm to navigate us off the main roads while I drive. He obliges but I start to sweat when the gravel and all civilization ends far out in the woods on BLM “roads”. Adorning the path shoulders are signs that read “NO target shooting allowed along this road.” I should stop to take a picture of the sign, but as this point I am more comfortable being a moving target. Storm assures me that we are actually on a road (the gps and google maps confirm this). Right now we are all alone except for the occasional deer fawn peeking out at us from their shady roadside arbors. 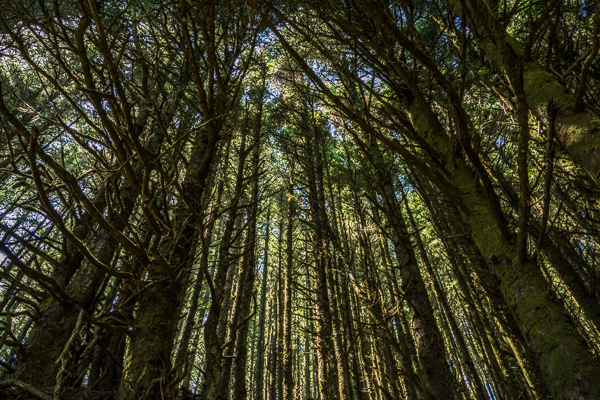 What should be a soothing ride through a lush forest is difficult for me to enjoy as I focus on appearing as non-target like as possible. We emerge on Hwy 36 which twists and turns beside rivers and lakes delivering beautiful scenery all the way to the Coastal Highway. 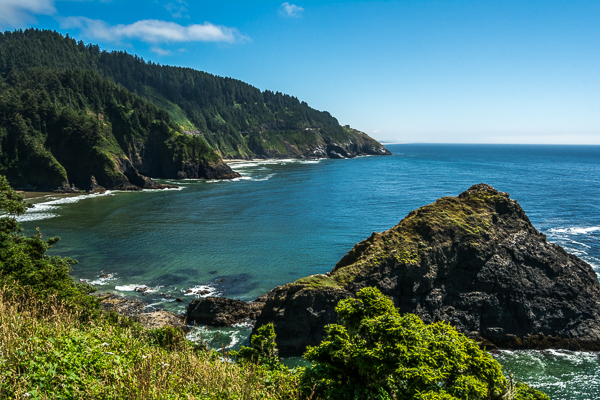 Any ride on Hwy 101 along the coast is sure to be breathtaking and the stretch to Heceta Head lighthouse is no exception. Glad you guys are having fun! Hope they get your Motorhome all fixed up. We spent a couple months giving tours at Hecita Head Light House. Had a good time. We definitely got our exercise going up and down that hill. Looking forward to seeing you guys in Albuquerque. Tell Charlie hi for us. 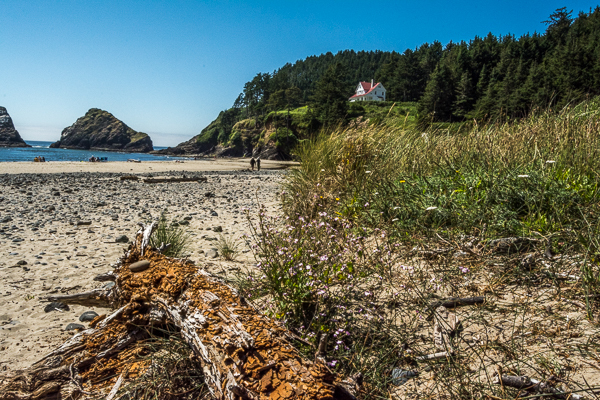 I did not remember that you guys volunteered at Heceta Head. No wonder you are in such great shape – climbing that hill everyday would be a great workout! Charlie says “HI” right back! 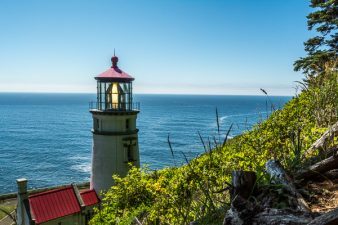 Heceta Head was one of our favorites because of the view of it from the overlook just south after you cross the bridge but be sure to visit all the light houses they are all great. Yes – that view is great. We are going to try and see them all if we can!